Everyone needs a hug from time to time so we named "Hilltop Bear Jugs" after the city of Hilltop, Ohio. Same day flower delivery, great prices, outstanding service, convenient locations and more have made Flowerama Hilltops favorite florist. Locally owned with four locations, Flowerama is the first flower shop to think of when you need to send a Get Well or a congratulations or flowers for any other life event. Shop our website, drop into one of our four design centers or call 614 256 6646 and your gift will be on its way. 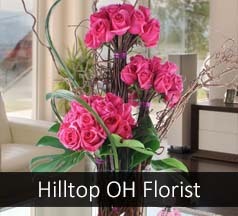 We also provide daily flower delivery to Hilltop businesses, Hilltop funeral homes, Hilltop schools, Hilltop hospitals, and Hilltop nursing homes.